During last couple of decades, it is stating the obvious to say that mobile telecommunications has entirely changed the world we live in. Over this period we have gradually switched from handwritten paper contact notebooks to electronic contact records in our mobile phones, however it is not only the phone numbers we store in our phones anymore: with the development of smartphones, they became or own personal data banks. Alongside the contacts, our small electronic friends now store so much data (passwords, photos, music, sometimes even medical records and biometric parameters etc.) that losing our device would most likely be a total disaster for one’s day-to-day routine. Some people even don’t remember their passwords from social media accounts, because their phones keep them securely stored in their memory. Loss of that sensitive data may be a problem, but it is transfer to another device is even more problematic. Everyone has, least once in their life, switched from one mobile phone to another. Back in 2000’s it wasn’t such a big deal: you switched the SIM card and all your data is easily transferred to the new phone. Those were the good old days when the contacts were stored on the SIM card and there was no hassle with gigabytes of photos and music. These earlier phones pretty much were meant to ring and exchange texts back then: no cameras, no players, not even mentioning the mobile internet. 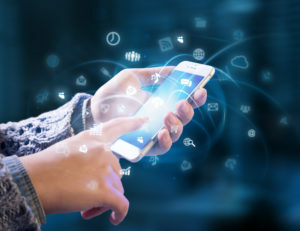 It was later in 2006-2007, when the smartphone market started to emerge, the problem of data transfer between two devices became bigger when different mobile operating systems decided to develop in completely different directions. By the beginning of 2010’s it became obvious that data transfer between Android and iOS devices became so difficult and time consuming, that leading developers could not ignore consumers’ complaints anymore, and a revolutionary step was taken. As one of the market leaders and most innovative consumer electronics companies, Apple made iPhone owners’ life easier, by launching of the “Move to iOS” app that provided an easy way to move contacts and other data from an Android phone to an iPhone. Google, as Apple’s biggest rivals on mobile operating systems market, developed similar technology in their own mobile device, called Pixel. They even included a dedicated adapter to make data transfer procedure easier. According to Google, the new Pixel phones ship with a dedicated Switch capability that allows users to transfer contacts, calendar events, photos, videos, music, SMS messages, iMessages and more from one device to the other. 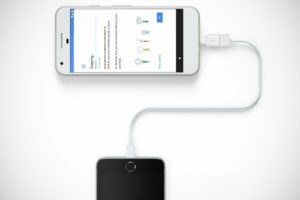 Quick Switch Adapter technology is a dedicated On the Go adapter that is shipped within the Pixel box, which Google confirms within its Pixel specs. Google describes the switch as a three-step process. Older phones have to run on Android 5.0 and up, or iOS 8 and above for iPhones. If data has to be transferred from an older Android phone, the process is relatively simple. For iPhone users, they turn off iMessage and FaceTime, then remove the SIM card. Then it is required to sign into your Google Account from the Pixel. Finally, Google will ask the user to select what data needs to be imported. Once that’s all decided, Google takes over and migrates the requested data. It’s as simple as that. These developments are a great example of how consumers benefit from a healthy market competition and innovative thinking about how to secure personal data that smartphones carry nowadays. 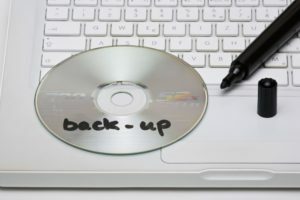 Anyone who is somehow related to IT industry will tell you: ALWAYS do backups of your data. No matter how secure you think all the cloud technology systems and personal hard drives are, just remember one thing: once data is lost – it is lost forever. Therefore, as a conclusion to this article, we at Falcon Technologies International strongly recommend to use dedicated archival optical media solutions to store all the sensitive and valuable data, that you would like to keep secure for a long time. It doesn’t take too much time to burn couple of DVDs, but it will ensure that your data is insured.